Tattoos may not be everybody’s cup of tea, but they have been part of many cultures for thousands of years. But how old are tattoos? At least 5,000-year-old as new tests on Ancient Egyptian mummies have shown. It was well known that the practice of tattooing human bodies was not exactly a recent development in human culture but now we know that the first tattoos were a lot older than we first thought. The National Geographic has recently reported on a new analysis that has found that two mummies have tattoos. The two mummies in question were found back in 1900 among other four mummies near the Egyptian town of Gebelien, along the river Niles. That is why they are known as the Gebelien mummies. Both mummies and the rest of their group are housed in the British Museum in London, England. The analysis that discovered the tattoos was carried out as part of a project with the goal of reexamining artifacts of value in the possession of the museum. Interestingly, one of the mummy is male while the other one is female. How Old Are These Mummies? British Museum specialists believe that these two tattooed mummies are from between the years 3352 BCE and 3017 BCE. Before this discovery, it was believed that ancient Egyptians only began to tattoo themselves millennia later. So, this discovery is now one of the earliest examples of tattooing of which specialists are aware. There is in fact only evidence of an older tattoo than that. The oldest tattoo has been found in the so-called Ötzi, the Iceman. His remains were discovered back in 1991 in the Alps at the border between Italy and Austria. Ötzi dates back to around the year 3370 BCE, so that is the earliest evidence of tattoos that we have. But, after the discovery of the tattoos on those two Gebelien mummies, the gap has been shortened considerably. What Do The Mummies’ Tattoos Represent? According to the findings of this reexamination published in the Journal of Archaeological Science, the tattoos found on these two Ancient Egyptian mummies represent images. Their tattoos are not geographical figures or anything like that. Instead, they seem to represent actual images from the real world. Of course, the tattoos have not been preserved untouched for thousands and thousands of years. In 2018, what is left of them is nothing much than a smudge. But thanks to infrared imaging, specialists can see what the markings that went by unidentified for so long more clearly than ever before. It seems clear enough that the tattoos are images from the real world. Scientists believed that the tattoos on the male mummy specifically represent a Barbary sheep and a wild bull. Despite the use of the same infrared technology, the tattoos on the female mummy could not be seen quite as clearly as those on her male counterpart. The scientists doing the reexamination have been able to identify different symbols on her body that might give us an idea of what images they are supposed to represent. They have been able to see four symbols who look like the letter “S” on the female body’s top shoulder joint, and a symbol that looks roughly like the letter “L” on her abdomen area. For these two symbols, scientists surmise that what is represented could very well be a wooden staff or a stave. How Did There Two Ancient Egyptians Get Inked? There are many things that make this discovery so exciting. One of them is that both men and women had tattoos. Before this discovery, it was firmly believed, or at least assumed that only women from that period got tattooed. There was evidence that in what is known as the predynastic period of ancient Egypt (between 4000 BCE and 3100 BCE) women got tattoos. This was solely based on some figurines that had been found and which depicted female figures with tattoos. It is important to note that this is the first time that actual tattoos have been found on actual people who lived in that period of history in that part of Africa. Before this discovery, all archeologists had found were representations of human figures wearing tattoos. It is also very significant that this shows that not only women got tattoos. Scientists suspect that there must be a symbolism in these specific tattoos, but they cannot be sure about what that is yet. According to curator Daniel Antoine of the British Museum, representations of sheep were widely used in that period of ancient Egypt’s history, but it is not known what the significance of sheep is. As far as the bull, its significance is understood to have something to do with male virility and the status associated with it. As far as the female mummy’s tattoos, scientists have not been able to shed any light as to their possible symbolism and its meaning. The tattoos on these two mummies were inked into the thicker part of their skin (the dermis) and the ink used was made from soot. It is believed that copper instruments were routinely used for the purpose of tattooing human bodies. This idea comes from the fact that some such tools have been found in the region where the mummies were found. 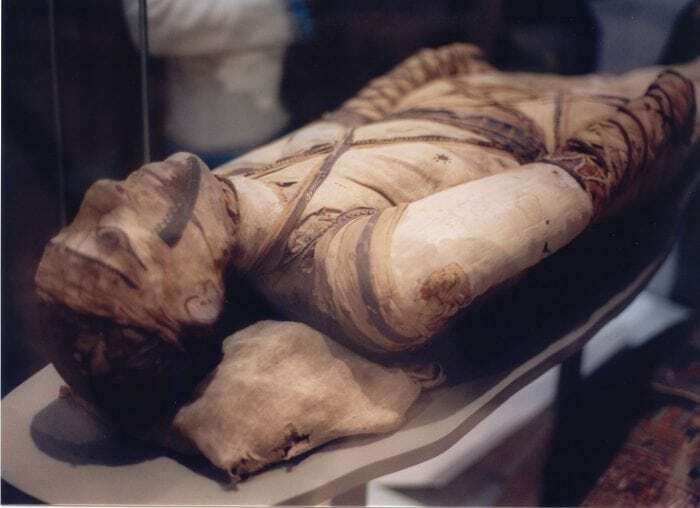 Scientists know that the male mummy was a man of about 20 years of age when he died. They have identified a stab as the cause of death from the damaged to his ribs. If nothing else, this new discovery sheds some light on the visual language on this period of ancient Egypt’s historical period.